Today I will teach you three cool blues licks to spice up your improvisation skills. There are a lot of blues licks out there that sound a little ordinary so here are some cool blues ingredients to make your improvisation sound more alive. The licks are all derived from the A minor pentatonic scale, so you can play the licks over an A blues chord progression or a song in Am. I wrote down the tabs (tablature) below. Check out the video to hear what they sound like and how to position your fingers. If you liked these cool blues licks you should definitely check out the 50CoolBluesLicksImprovisation course. 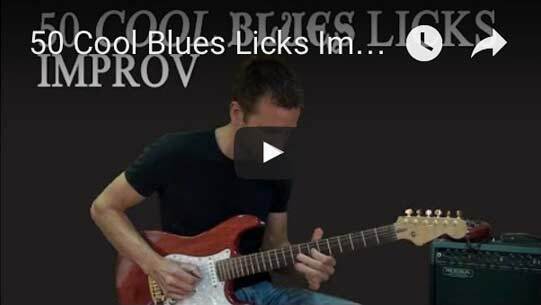 The 50CoolBluesLicksImprov course will help you develop a thorough understanding of how to play the pentatonic/blues scale all over the neck with great licks, solos, tricks, exercises and more and how to apply that to soloing and improvisation. You’ve created a good resource and highly relevant site. Good luck with it and I will be checking back on this rich info..
Klaus, thanks for the licks. I’m a hobbiest who can use new insight. Hope you will continue with blues lessons and maybe get into scale practice methods for us beginers. Hey Klaus! Thanks for this lesson… i hope we’ll get more like this…. I am planning to make more guitar lesson videos very soon. So keep checking for new posts.